Watch a video clip about Big Ben and its home at the Houses of Parliament. What would you do if you spotted a dinosaur in London's St Pancras International Station? Go on a virtual visit of London's tallest building, the Shard, with a group of schoolchildren. See how a spacecraft from Russia was put inside the Science Museum in London. Watch a clip of the Changing of the Guards at Buckingham Palace. Meet the ravens that live at the Tower of London. Print out and shade in a picture of the ravens at the Tower of London. Take a guided tour of Hampton Court Palace led by an actor dressed as one of King Henry VIII's Yeoman of the Guard. Fly over London, then go underground and see how giant boring machines dig tunnels for new train lines. Go back in time and fly through the narrow streets of London before the Great Fire in 1666. Print out and shade in a picture of The Globe where Shakespeare's plays are performed. 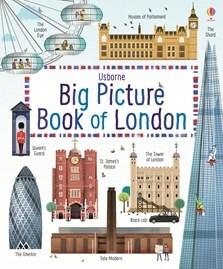 A fabulous picture book packed with fascinating details about London’s most famous sights, from Buckingham Palace and The Tower of London to Trafalgar Square and the museums in Kensington. There are pages on London’s parks, transport and sporting events, and two stunning fold-out pages show all the bridges and landmarks along the River Thames.